Representatives from Community Consolidated District 15 and Township High School District 211 describe student transition from 8th grade to high school to a delegation of educators visiting from Zhejiang Province, China Oct. 25. 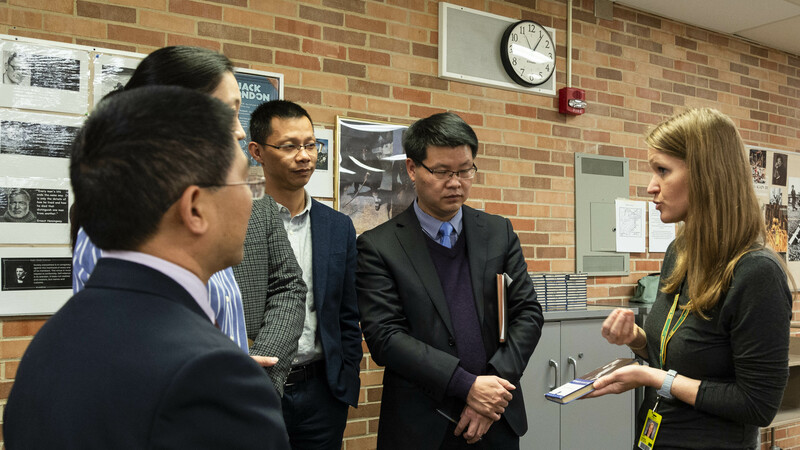 A group of more than 20 education staff from the Zhejiang Province of China toured William Fremd High School on Nov. 1 as part of a multi-week education tour. The group first met with representatives from Community Consolidated School District 15 and Township High School District 211 at the District’s G.A. McElroy Administration Center in Palatine Oct. 25. During the meeting at District 211’s Administration Center, representatives from both districts described the details of the schools ranging from demographics to course lists, and typical school day activities. District 211 Associate Superintendent for Student Services Mark Kovack said the group was specifically interested in learning how 8th grade students are supported in transitioning to high school. Following the meeting, the delegation traveled to District 15’s Plum Grove Junior High School where they had the opportunity to tour the school and observe classes. 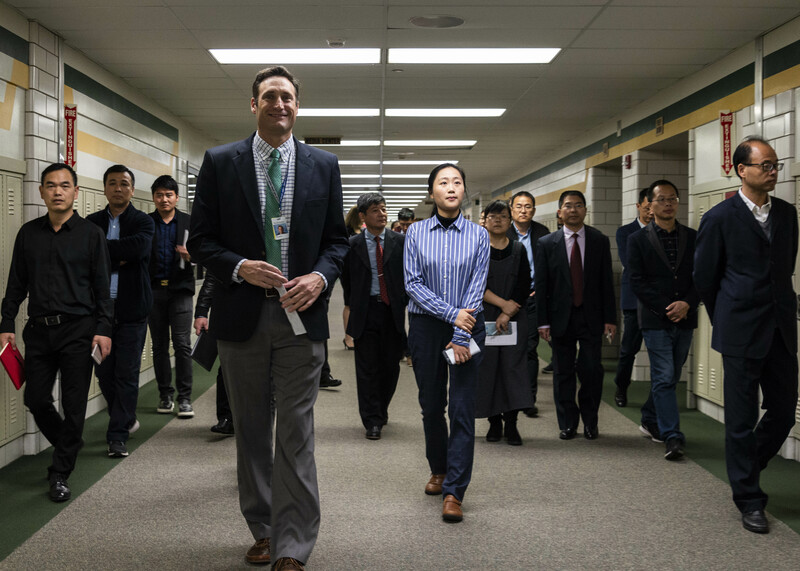 William Fremd High School Principal Kurt Tenopir leads a group of educators visiting from Zhejiang Province, China on a tour of the school Nov. 1. On Nov. 1, the delegation returned to Palatine to tour Fremd High School. After a brief introduction by Principal Kurt Tenopir, the delegation broke into small groups and were taken to a variety of different classes. The groups observed classes ranging from computer programing and A.P. English to American Studies and Applied Technology. 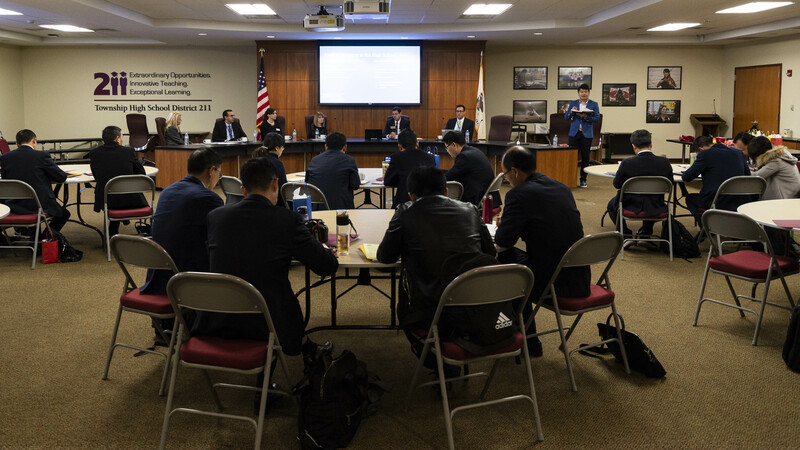 Delegation member Quing Song Wu said that while classes such as biology and mathematics were similar both at Fremd High School and in China, there were some classes that he was surprised to see. Wu added that he was impressed by the diversity of curriculum offered in District 211. “It seems every student can find classes they will like here,” he added. William Fremd High School Junior Andrea Jing describes her AP English assignment to an educator visiting from Zhejiang Province, China, Nov. 1. Kovack said having visits such as this can provide a unique learning experience for not only the delegates, but for the District as well. William Fremd English Teacher Laura Marsh describes the school’s American Studies curriculum, which combines American Literature and American History, to a group of educators visiting from Zhejiang Province, China, Nov. 1.